Chilled sophisticated music that mixes acoustic instruments like guitar, piano and cello with electronic dance beats, basslines, synths and strings. A musical journey of sonic lushness which brings the beach to the city and the city to the beach. 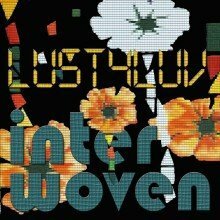 My acrylic canvas painting named “Broken Flowers” was digitally edited to create the Album Cover for LUST4LUV Interwoven, and monochrome Imprint version for CD design.